Docker is awesome. It enables software developers to package, ship and run their applications anywhere without having to worry about setup or dependencies. Combined with Kubernetes, it becomes even more powerful for streamling cluster deployments and management. I digress. Back to Docker. Docker is loved by software developers and its adoption rate has been remarkable. It’s a platform for building, testing, deploying and publishing containerized applications. I say platform because Docker is a set of tools for managing all-things related to containers. Containers are at the heart of Docker so that’s what we’re going to explore in depth next. Containers provide a way to install and run your applications in isolated environments on a machine. 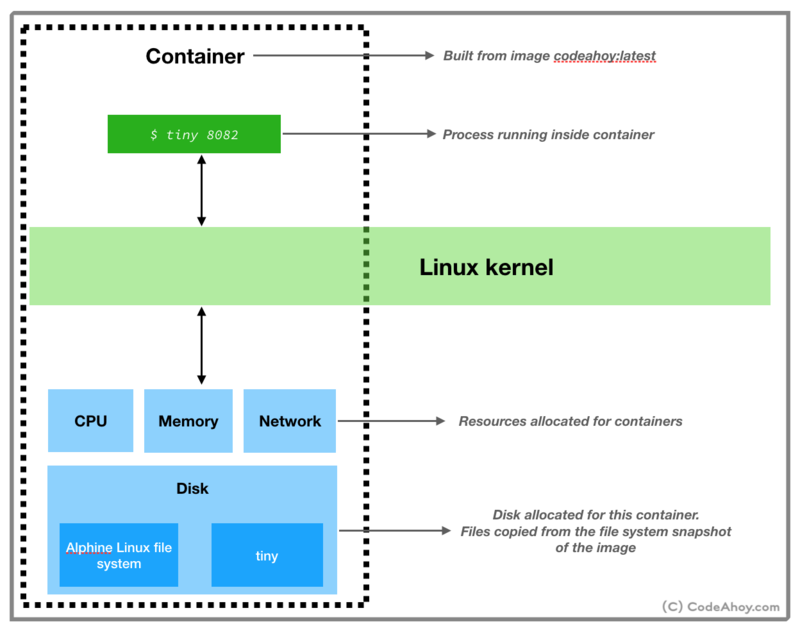 Applications running inside a container are limited to resources (CPU, memory, disk, process space, users, networking, volumes) allocated for that container. Their visibility is limited container’s resources and doesn’t conflict with other containers. You can think of containers as isolated sandboxes on a single machine for applications to run in. I’m over simplifying but Linux namespaces basically allow users to isolate resources like CPU, between independent processes. A process’ access and visibility are limited to its namespace. So users can run processes in one namespace without ever having to worry about conflicting with processes running inside another namespace. Processes can even have the same PID on the same machine within different containers. Likewise, applications in two different containers can use port same ports (e.g. port 80). croups allow putting limits and constraints on available resources. For example, you can create a namespace and limit available memory for processes inside it to 1 GB on a machine that has say 16 GB of memory available. By now, you’ve probably guessed how Docker works. Behind the scenes, when you ask Docker to run a container, it sets up a resource isolated environment on your machine. Then it copies over your packaged application and associated files to the filesystem inside the namespace. At this point, the environment setup is complete. Docker then executes the command that you specified and hands over the control. In short, Docker orchestrates by setting up containers using Linux’s namespace and cgroups (and few other) commands, copying your application files to disk allocated for the container and then running the startup command. It also comes with a bunch of other tools for managing containers like the ability to list running containers, stopping containers, publishing container images, and many others. 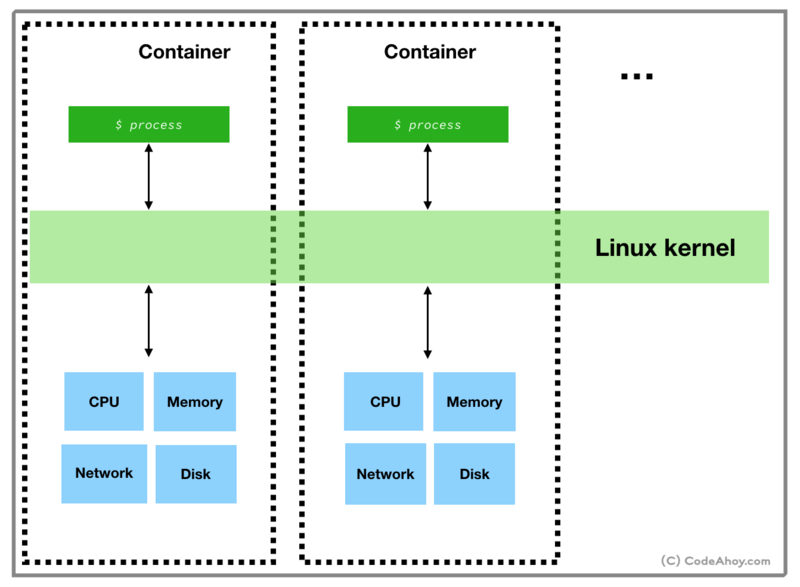 Compared to virtual machines, containers are light weight and faster because they make use of the underlying Linux OS to run natively in loosely isolatated environments. A virtual machine hypervisor creates a very strong boundary to prevent applications from breaking out of it, where as countainers’ boundaries are not as strong. Another difference is that since namespace and cgroups features are only available on Linux, containers can not run on other operating systems. At this point you might be wondering how Docker runs on macOS or Windows? Docker actually uses a little trick and installs a Linux virtual machines on non-Linux operating systems. It then runs containers inside the virtual machine. File system snapshot containing your application and all of its dependencies. A startup command to run when the container is launched. Back to creating our Dockerfile so we can build an image. It’s extremely common in the Docker world to create images based on other images. For example, the official reds Docker image is based on ‘Debian’ file system snapshot (rootfs tarball), and installs on configures Redis on top of it. In our example, we’ll base our image on Alpine Linux. When you see the term alpine in Docker, it usually means a stripped down, bare-essentials image. Alpine Linux image is about 5 MB in size! Alright. Create a new folder (e.g. dockerprj) on your computer and then create a file called Dockerfile. Paste the following in the Dockerfile. The Dockerfile above contains instructions for Docker to create an image. Essentially, we base our image on Alpine Linux (rootfs tarball) and set our working directory to be /home. Next, we downloaded, compiled and created an executable of a simple web server written in C. After, that we specify the command to be executed when container is run and expose container’s port 8082 to the host machine. Now, let’s create the image. Running docker build in the same directory where you created Dockerfile should do the trick. umermansoor:dockerprj$ docker build -t codeahoydocker . Let’s understand what’s going on here. In the end, I’d like to add that while Docker is awesome and it’s a good choice for most projects, I don’t use it evewhere. In our case, Docker combined with Kubernetes makes it really easy to deploy and manage backend microservices. We don’t have to worry about provisioning a new environment for each service, configurations, etc. On the other hand, for performance intensive applications, Docker may not be the best choice. One of the projects I worked on had to handle long-living TCP connections from mobile game clients (1000s per machine.) Docker networking presented a lot of issues and I just couldn’t get the performance out of it and didn’t use it for the project. Hope this was helpful. Until next time.